there is a USD 10,000 limit on the amount of local or foreign currency that can be imported into the country. food in proportions corresponding to the personal needs of the traveler. NB : The above mentioned quantities are fixed for a person, ( however exclusion of children under 18 years regarding tobacco and alcoholic beverages). - Comply with the formalities related to foreign exchange controls. All imported goods are subject to a detailed declaration that assigns a customs procedure. The exemption of duties and taxes to the entry does not remove the obligation of declaration. This can take several forms. * Implied: in this case, use the lane "Nothing to Declare" or corridor "Objects to declare". Written and detailed declaration is mandatory in cases where goods are not accompanied, even though these goods are not taxable. Finally, depending on the nature of the goods concerned, the importation may be subject to special requirements. Subversive publications, likely to disturb public order. protected animal species : compliance with the requirements of the International Convention on protected species. Regardless of the obligation of the declaration, the imported goods should lead to the liquidation, by the Administration of Customs, of duties and taxes under the Customs Tariff and, secondly, to the recovery of those taxes and duties by Treasury. The export of Liberian products is exempt from payment of output duties and taxes. It is the same for products re-exported following their stay. In any event , the goods exported or re-exported must be declared. This obligation is subject to the same forms as at the entrance. Thus the statement can be verbal for the output of souvenirs and Liberian products, when the nature and quantity of these goods have no commercial character. For exports and re-exports that are commercial in nature , the filing of a detailed and written is required. 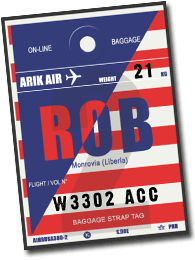 All local or foreign cash exiting Liberia that is greater than USD 7,500 must be declared at customs. Large sums of money can only be exported in the form of bank drafts or travellers cheques or other similar methods of transport.